Fettuccine Alfredo is a classic Italian dish that has been called an adult macaroni and cheese. It's easy to make and oh so delicious! Then again you get the others that think of all the ways to make the dish less fattening by sucking all the flavors out of the dish. 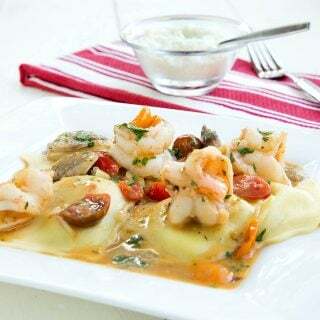 While there are ways to cut back on the fat and calories, making Fettuccine Alfredo less artery clogging, you also need to remember that this isn’t a dish that you’ll eat very often. That being said an occasional splurge isn’t necessarily a bad thing. And of course, you can enjoy it as a side dish instead of the main course reducing the damage that bowl of deliciousness may cause. Now there is a trick to this method because if you’ve never tried heating Greek yogurt I’ll tell you right now it doesn’t work. Greek Yogurt pretty much turns to water when heated, so the trick is to let the Greek yogurt come to room temperature then blend it together with the not noodles immediately after you’ve drained them. Add a touch of cream and the grated Romano Cheese and you’ll have a very tasty low-fat version of Fettuccine Alfredo. Still, for my money, I’ll keep the recipe intact and only for very special occasions and as a side dish. 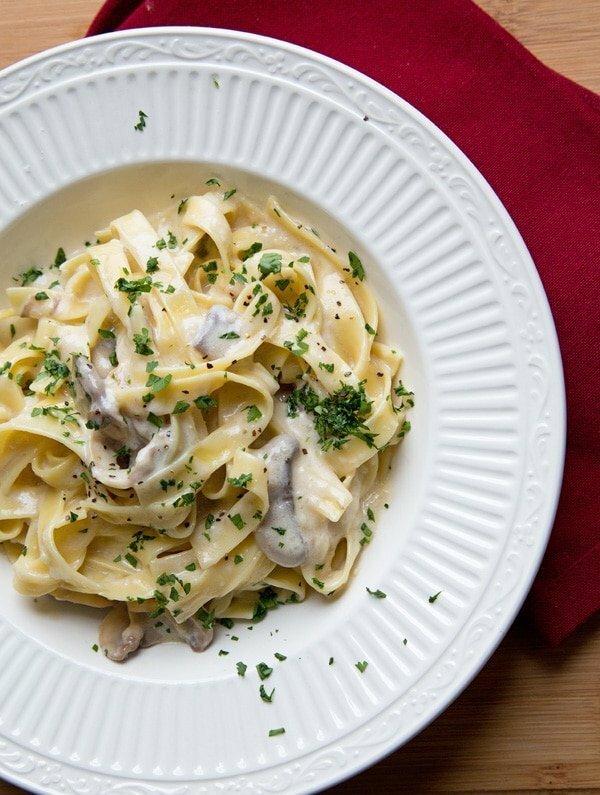 You’ll find many different interpretations of Fettuccine Alfredo, some without mushrooms, some with nutmeg and of course the original without any cream at all, just butter and grated Romano. 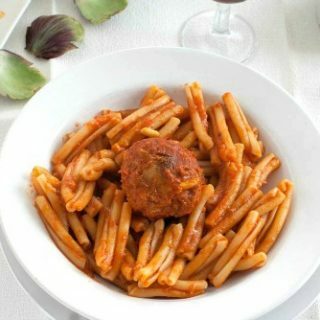 I hope you enjoy my version of this Italian Classic! Reduce heat and continue to simmer until the pasta is done. Drain pasta and add to the cream mixture along with the romano cheese and black pepper. 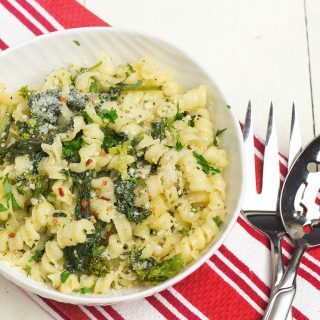 Toss pasta in mixture until completely blended and serve immediately with a sprinkle of chopped Italian parsley and crusty bread! Silly question but why unsalted butter not only in this recipe but others? Thanks for sharing. The reason you see unslated butter in most recipes is so the person preparing the food can control the salt content of the dish. In the case of the fettuccine Alfredo the cheese will add saltiness so I use unsalted butter. Drooling over your pictures. Glad I was able to stumble upon your website. Printing your recipe now so I could try it out making over the weekend. 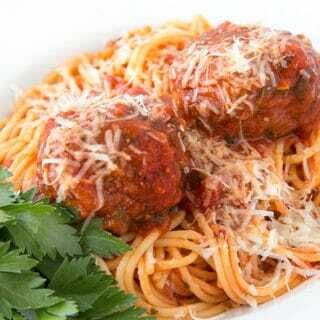 This is a favorite family meal and yours looks delicious! My oldest daughter is nine and asks for fettuccine often. My Italian husband definitely appreciates it when I make it. Trying your recipe this weekend! Chef Dennis – you can cook for me anytime!! I love your recipes and your fettuccine alfredo looks easy enough for me to even make. Thank you. 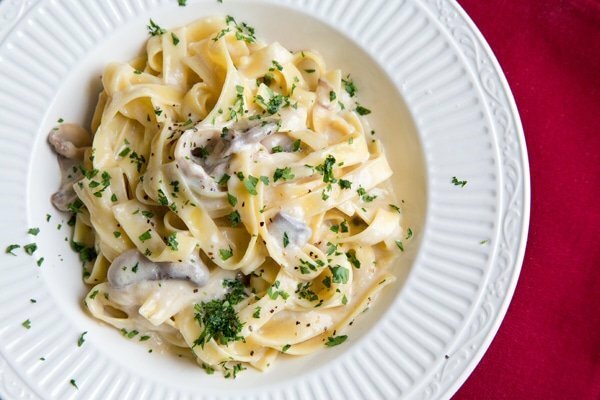 This fettuccine alfredo looks super tasty. 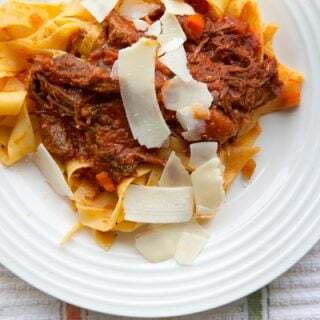 My husband would absolutely love this so thank you for sharing the recipe. 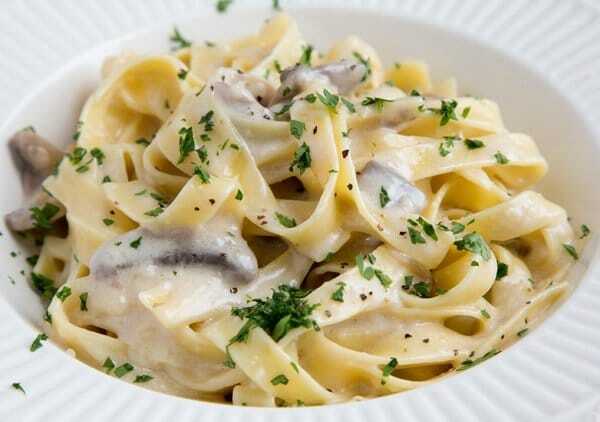 Mmm, doesn’t get better than classic fettuccine alfredo. I love mine with chicken though! This looks ah-mazing! I have a goal to make my own noodles soon and I think this Alfredo sauce will go perfectly with it! It looks so amazing!!! Thank you for the tips and tutorial on making alfredo sauce. I love it, but never made it well. I am eager to make this for my family and surprise them! My kids totally love alfredo. I’ll have to make this for them! It is a nice filling meal especially before their swim practices. I love fettuccini alfredo. I definitely agree with you that there’s no need to make it less fattening, just enjoy it in moderation! Chef your recipes always look amazing. I want to try this one out! This is one of my favorite meals to order at a restaurant. I should totally make my own version at home one day. I am drooling. I just LOVE fettuccine alfredo. It’s been ages since I’ve had it. This looks incredible. I LOVE Alfredo! It is my favorite but I am alone in my love for it at my house. This looks like a perfect recipe for girl’s night. We often get together and have dinner and wine. It is fun to cook and laugh in the kitchen with your friends. Alfredo is a favorite in my home. I can’t wait to give this recipe a try. It looks so savory! I haven’t made this in a long time. Your photos make it look awesome, and I need to make it again. THIS needs saved because this is my husband’s FAVORITE DISH ever!!! We love fettuccine Alfredo! 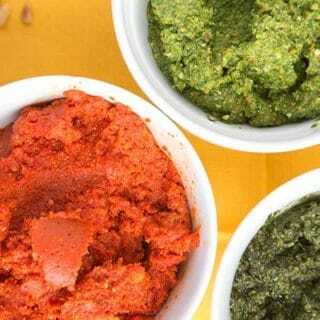 It is an extremely rich dish so we definitely use it more for special occasions and other things. I will have to keep this recipe to use next time we make it. One of my favorite dishes. Husband not a fan so I don’t make it often. FYI. Your site is really slow at loading and I can never comment from my laptop only my phone. My husband hates mushrooms. any substitute? BTW. I would just leave them out if he doesn’t like mushrooms. It really won’t hurt the dish. I’m happy to hear you enjoyed the tiramisu, it is my favorite! I love Fettucine Alfredo. It’s one of my favorite dishes and indeed is special for any occasion. It is a very special dish! Thanks Anda! Yes. This is definitely save for special occasions but it sure looks amazing. And you’re definitely right with the Greek Yogurt. This is certainly delicious. Gotta love Fettuccine Alfredo Maureen and there are lots of tricks to make it lighter and healthier! Good evening Mr. Dennis, what a pleasure it is to meet your acquaintance. I have to say after reading this blog I could feel my hips widen at the thought of the indulgent recipe, and have decided as such that I don’t care. I have decided to enjoy life in it’s great balance and if that mean my hips widen, on occasion, with indulgent recipes such as this then so be it. I look forward to your next indulgence as well as the balance of such recipes. Have a splendid day and God Bless! Yep. You’re correct. I don’t prepare alfredo very often because of the calories I consume with it but it certainly is delicious. Thanks for stopping by DB! Looks delicious Dennis and I love alfredo, but definitely save it for special occasions. Thanks Larry! I honestly don’t think we have it more than twice a year, but when we do its a wonderful experience!